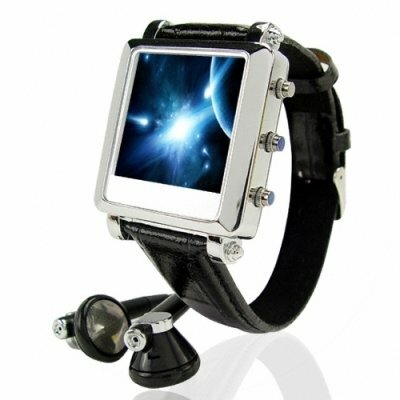 Successfully Added Stylish Dress Watch 1.5 Inch LCD MP4 Watch Player - 8GB to your Shopping Cart. Great looking chrome MP4 Player Dress Watch with leather strap. Wear this digital media watch anywhere you want and it looks cool. People will never realize that a full featured PMP (portable media player) is actually packed inside your stylish watch. A vibrant CSTN display will make sure that watching videos is a wonderful viewing experience. While the large 8 GB's of internal memory makes it easy for you can carry around all your favorite music and video files. You can even use this watch like a portable USB flash drive to carry around all your most important work or school project files! With a low factory direct price and quick shipping options, you can have your new watch "gadget" on your wrist in no time at all. Order yours now!